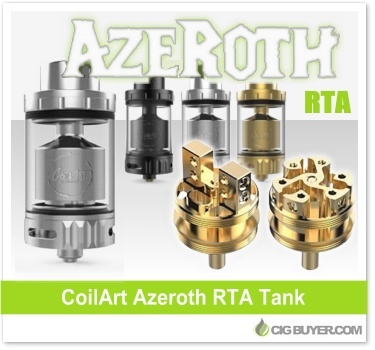 Considered by many to be one of the best RTA’s of 2017, the 24mm CoilArt Azeroth RTA Tank is top-filled, can hold 4.5ml of juice and comes with two interchangeable gold-plated decks: a stacked terminal two-post deck and a postless triple coil build deck. Between the two there is enormous flexibility creating unique and complex builds, and the large dual airflow slots on the base can be fully adjusted or closed. The Azeroth Tank comes with two proprietary threaded drip caps; an 11mm bore stainless steel and 8mm bore delrin cap.